Lossiemouth recently welcomed home Heather Stanning, after winning her second gold at rowing in the 2016 Olympic Games in Rio. Heather was welcomes to the Town Hall by a piper and held an open microphone session with members of the general public. Later that evening Heather switched on the lights that illuminated the Lighthouse gold in her honour. 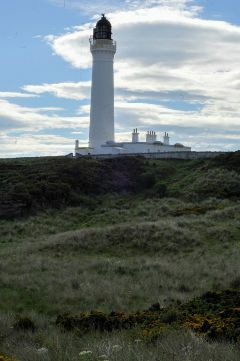 Covesea Lighthouse was delighted to receive a visit from Heather and her family recently. 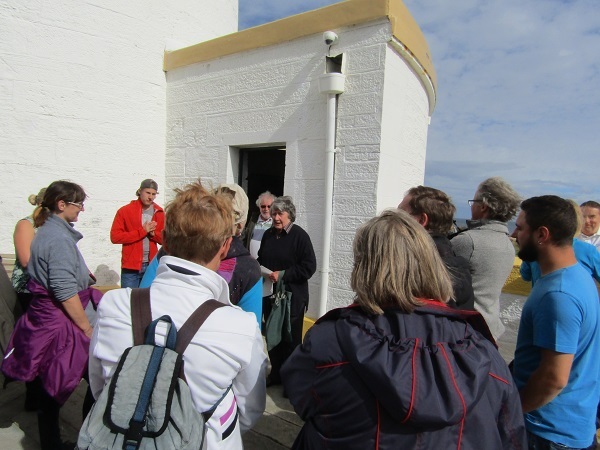 Elgin Twin Town group from Landshut, Germany on a guided tour of the Covesea Lighthouse by Ioan Keilhorn, grand-daughter of Lossiemouth's famous Prime Minister, Ramsay Macdonald. Many thanks for everyone who came along to our Grand Concert. We were all kept entertained by the Reel Society as well as individual artists. A grand total of approx £600 was raised. 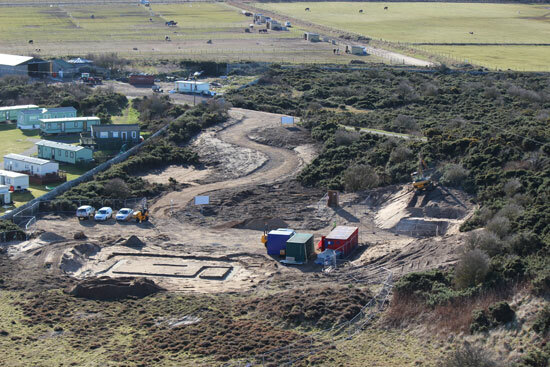 On completion of the new centre the next project for Covesea Lighthouse is the restoration of the Grade A Listed steading and well. 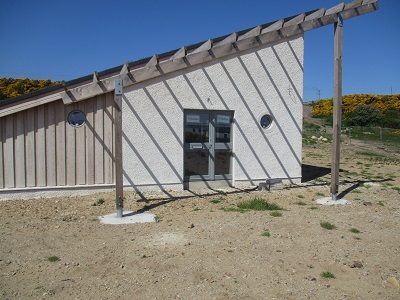 Exterior of the centre is now complete and electricity supply installed. Funding is required to complete the inside of the centre and the exterior groundworks including the pond, landscaping and carpark. 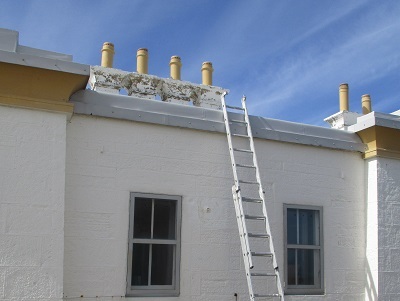 Covesea Lighthouse gratefully received a donation of £1000 towards paint for the lighthouse cottages and quarterdeck. Students from Moray College kindly volunteered to come along and provide their services free of charge. Angela Callister made this painting of Skerryvore Lighthouse in 2008 but with the Lighthouse incomplete and later gave it to her brother. 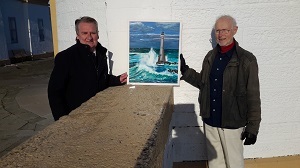 After Angela died in 2014 he completed the Lighthouse and then donated the painting to the Covesea Lighthouse Community Company, which is particularly fitting as it was Angela 's favourite picnic place. 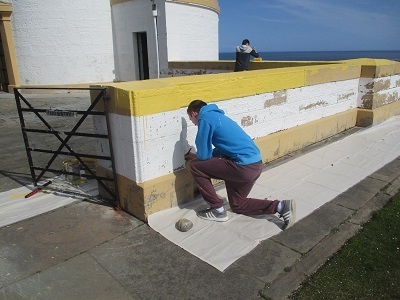 Angela (from Elgin) and her brother (from Carlisle) became enthusiastic visitors to the Scottish Lighthouses after reading "The Lighthouse Stevensons"
CLCCL are delighted to accept the painting and will ensure that it can be enjoyed by both local people and visitors to Covesea Lighthouse. On Friday 5th June 2015 we were happy to invite representatives of the Board of Trustees of The Gordon and Ena Baxter Foundation to view the progress of the new and exciting RNAS and RAF Heritage and Education Centre. 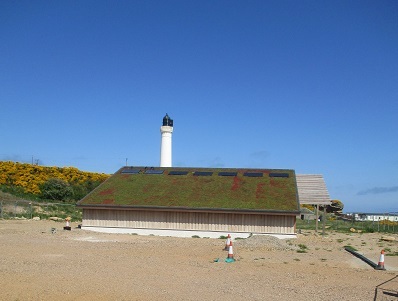 A big thank you to The Gordon and Ena Baxter Foundation who have contributed £25k specifically for the exterior, in particular, the iconic sedum roof and surrounding landscaping. 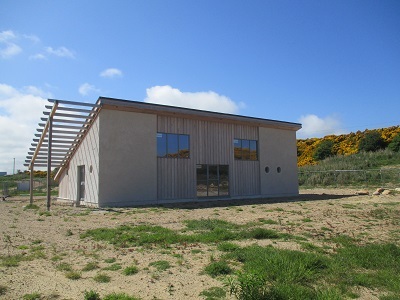 The environmentally-friendly building has been designed by Cullen firm NB Planning and Architecture to be modern, yet still sensitive to its historic and natural setting. 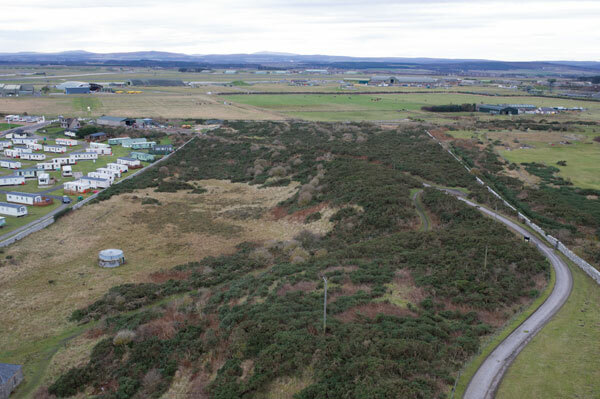 The firm’s Design Statement within its Planning Application outlines the concept with distinct RAF influence : “The building is integrated into the landscape by making it appear as if it has risen up from the grass itself … almost as if to provide the adjacent plane with a take-off ramp”. The Statement goes on to say: “In further homage to the RAF, the building is inspired by the nearby grass-banked ammunition shelters at the Lossiemouth base”. 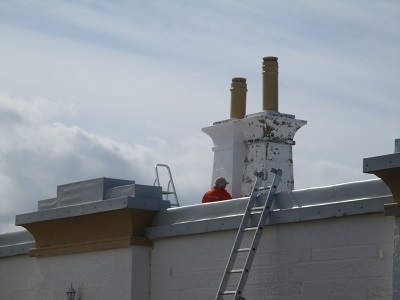 The contractors for this project are Grant and Anderson of Dufftown. 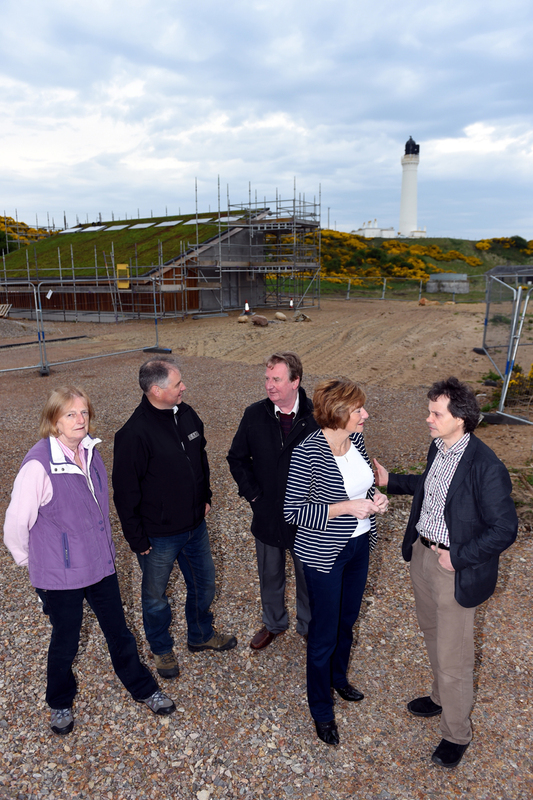 9th May 2014 were honoured and delighted to welcome HRH the Duke of York to officially the Lighthouse, though we had to confess that we had not at that time completed all the necessary safety alterations. In June 2014, thanks to a grant from the Community Covenant Fund we were able to purchase the adjoining land and building from Holts Leisure. 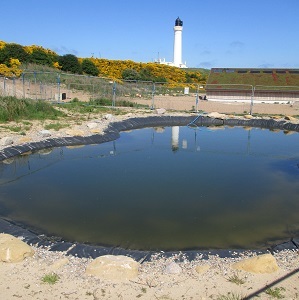 This has enabled us to reunite the Steading and Well which once played an important role in the life of the Lighthouse Keepers and their families. The Association of Lighthouse Keepers provides a forum for everyone interested in lighthouses, lightships and maritime aids to navigation. 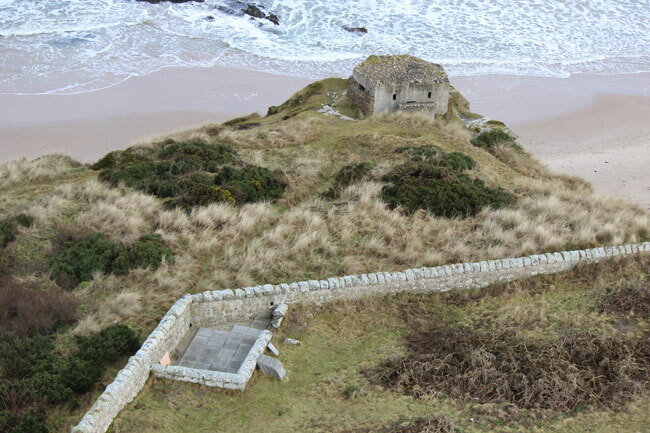 The ALK holds a large archive of lighthouse related materials and has helped and advised the setting up of display material at lighthouses open to the public around the UK. We really appreciated the advice that they were able to give us and look forward to using their expertise in the future. 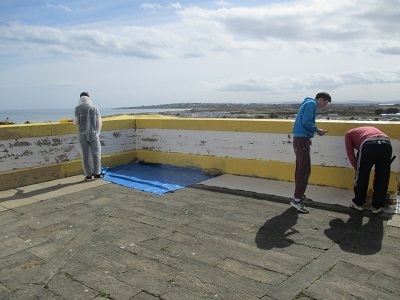 At the end of June the Skills Force Group from Elgin Academy came to the Lighthouse to build a patio for us in a sheltered corner. These young people planned the patio and accessed all the materials that they would need to complete the task. They got a day of school on the Friday provided that they also came back to finish the job on Saturday which I am proud to say that they all did. It was not all hard work though, as after lunch which we provided for them they all disappeared down to the beach and came back rather wet having had a great time. Luckily we had plenty towels. 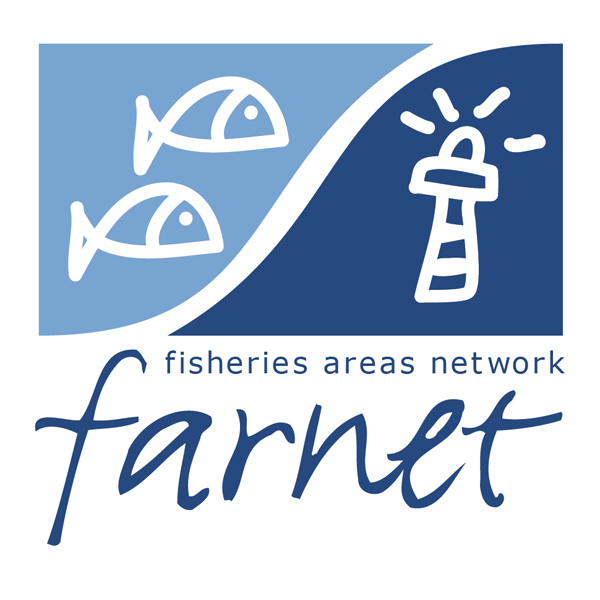 A group from the Ostrobothnian Fisheries Association came to Scotland on an exchange visit to look at projects that had been funded through the Moray European Fisheries Fund. The visitors were a cheerful team of professional fishermen, Fisheries Local Action Group project promoters and members of FLAG. All of them belong to the Swedish speaking minority that lives in the Ostrobotnian coastal area. 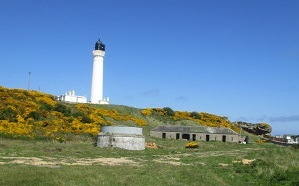 The Lighthouse was chosen as an example of one of the projects supported by Moray FLAG. 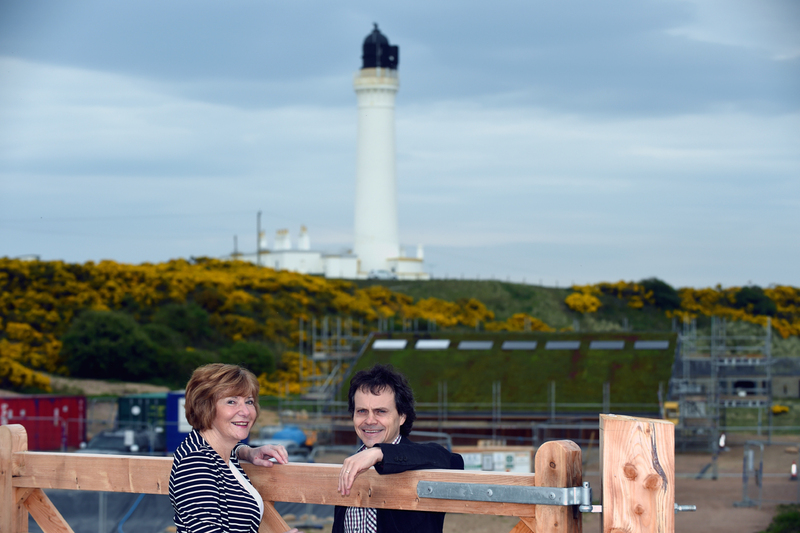 They were welcomed to the Lighthouse by members of the Board and Rab Forbes gave them a guided tour of the Lighthouse at the same time as explaining the multi faceted nature of this project. 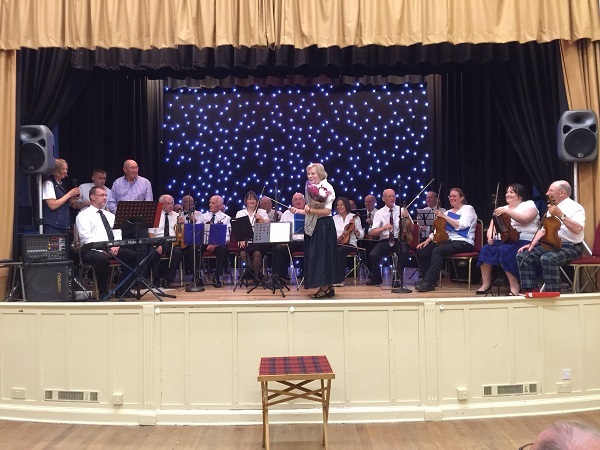 November once again saw the Elgin Strathspey and Reel Society performing at the Town Hall in Lossiemouth to raise funds for the Lighthouse.